15+ Cocktail Reception Gowns every Bride-to-be must see for her 2018 Wedding! Cocktail gowns add a touch of glam to any evening affair. If you don’t wish to wear a lehenga on your sangeet/mehendi/reception, you can always opt for a cocktail reception gown that fits the queen! Below are 15+ wedding gowns that will help you select yours better! 1. This bride’s pearl gown with intricate golden work is a win win! 2. 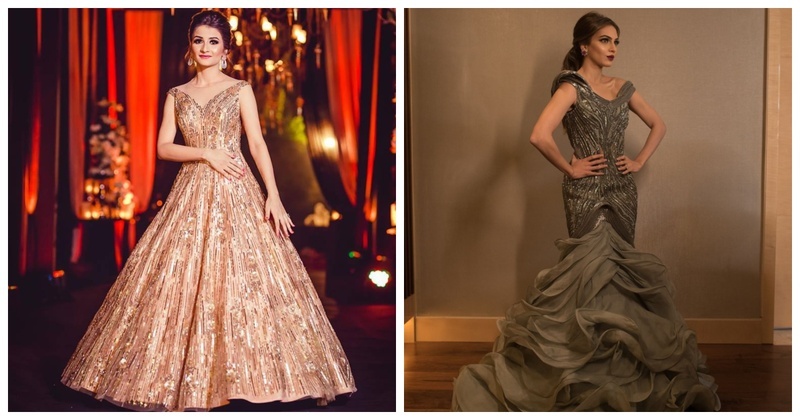 T.V Actress Rubina Diliak’s sheer magical cocktail gown is out of the box and definitely worth trying! 3. A silver gown with applique work in the middle sets major goals! 4. Bride and designer Soumya Nandivada designed her own gown. I love the colour! 5. This bride’s gown looks like a 3 tier cake! 7. I love white satin gowns with heavy work on them! 9. Sheer and simple?! We got you, babe! 10. This bride wore a plain black gown and accessorised it with a beautiful diamond necklace. Love the lack of bling! 11. Don’t miss the flowery border of this peach gown! 12. A royal violet velvet gown is perfect for every occasion! 13. This blush gown has got my heart! 15. This suede gown is making the bride glow more! 16. Actress Aahna Kumra is doing total justice to this blingy evening gown! 17. The classic colour combination of emerald and gold shall never ditch you! It is hard to select a favourite one from above! Which one is yours?